that do the job in place of repair. Mega Power ends engine tapping freeing stuck valves, avoiding its costly repair, its repair down-time. Inexpensive, easy to use products that end engine tap explained. Mega Power quiets engine tap helping car owners avoid costly repairs. Engine noise is a worrisome car problem. There are many remedies offered. We review the few that do work! Tap causes and remedies are covered here, with ordering info, starting with the mechanic's education about it. What this isn't? This is not an aspirin type fix. You get those at part stores and quick lubes. These are two tap ending tips that work. One is a service method we promote, you can perform to end engine tap using it. Its a much better solution to your car noise problem, giving you anti-wear know-how to end your engine tap, and other wear and tear problems - at the same time. With occasional servicing of your engine twice year, and with companion products suggested to service other components every 4 years, your engine will benefit from less strain put on it by other components as their now-ongoing growing wear and tear ways are eliminated with the same anti-wear - and avoids common costly-to-repair problems these other components can create for you. This works for good running vehicles also you want to protect and extend the costly investment you have in them. The entire vehicle service will give you peace-of-mind about avoiding what could be trouble avoided, and having ongoing sweet running cars and heavy equipment you control their destiny - not luck. Look into our specials to service the transmission, power steering, and radiator to help you with maintenance to avoid thousands in avoidable costly, worn out premature replacement down the road in time. OK, my whole car servicing sales pitch is done - now tap problem solving my way. It does so by chemistry made to return the slower-wearing clean, smooth, close-fitting, like-new performance you paid so much for - even synthetic oil can't provide. I'm george christ, to help you, the country's expert to end you tap in an amazing way that will please you with benefits no one else offers. What's offered is installed in the engine easily and just ordinary men and women vehicle owners - who don't know a gas cap from a radiator cap, end their engines tapping with my method. Nothing to take apart! Just driving in few minutes to a day or so will not just end your engine tap, bur actually extend for years the trouble-free life of this and every vehicle you add the same treatment care to at oil change intervals. That's another option I'll teach you. Especially your newer, good running vehicles, to avoid their common expensive engine repairs developing in them right now! They usually fail in some way just after the warranty ends - ever notice that? MMMMM wonder why? My method does not cost, as its fix pays you back many more times than its cost. Your tapping occurs from a metallic hammer-like smack at each engine rotation -tap tap tap. Carbon causing the tap tap tap and carbon occurs in 2 or more locations to cause tapping. Oil is not able to remove that carbon. Oil helps cause carbon as it lubes. However, out product removes that carbon, and with its conditioning ends the tap - easily. If tap tap tap is the sound you here from your motor, engine dismantling and valve machining is what removes that carbon and engine tap - by repair, if a mechanic ends the problem. Cost run $2000 to $5000. I know! I'm a mechanic. How to easily rid your Engine Tap Remedy. Mega Power is made to remove that carbon chemically, stopping the tap. Cost run $200 for cars pickups, to $400 depending on more needed for large truck engine size. Still a bargain! Not the $2000 to $4000 by repair cost if done by actual repair. My way makes for a better running vehicle that never return, actual repair can't offer! Valve tap remedy. Order Mega Power Engine Treatment to end your valve tap. Tar-like residues from cooking hot combustion blow-by in your oil causes engine carbon. Those residues bind, hold open, or slow snappy valve-closing speeds. This causes valves and their lifters to close slowly - creating a space and at each engine rotation a tap, tap tap sounds. Mega Power ends this problem. End your tap this way - my way. Its better and cheaper. Mega Power is made to remove that carbon, stopping the tap. Mega Power uses the 6 different ingredients needed to get to, and dissolve the carbon, to let valves close fully and work quietly again, to end the problem. The other choice, a $3000 top engine dismantling and valve machining is what removes that residue to end that engine tap problem. Thousands of wise vehicle owners chose Mega Power as their remedy of choice. Sure, a few times it did not work. 2 refunds requested last 267 days. That is an option that removes risk from trying Mega Power. It takes 6 different items to end the tapping. 3 items shown are added to the top of the motor, 3 are added a week later during an oil change. Driving does the actual fix. Nothing to take apart. Your purchase includes easy-to-follow instructions, phone help, guarantee. Shipped to your door in 3 days. Order The Mega Power Engine Noise Ending Treatment. The Mega Power Engine Tap Treatment includes the 6 different carbon removing cleaners shown, that have engine saving friction modifiers needed to clean and protect. 6 items total needed. Easy-to-install instructions, phone help, guarantee included. Shipped to your door in 3 days. Just $99. Not $3000. Order one Mega Power Engine Treatment $84+ $15 s&h= $99 total. Click cart button to start the quieting fix. Valve adjusters, called lifters cause tap and motor noise when sludge and residues block oil to the adjuster, and it drops. A space appears making the noise with motor parts banging due to the space. Mega Power uses the 6 different ingredients known - some proprietary, needed to get to, and dissolve the sludge, to let the adjuster part close the gap fully and work quietly again, to end the problem. Otherwise, a whole engine dismantling is needed to get to and replace the 8 to 24 lifters with new ones as the engine tap remedy. Of all the products out there, only Mega Power is sold and guaranteed to Save Your Motor, Your Budget - and end your anxiety as to what to do. Engine taps, knocking, and thud sounds emanate for different reasons. Here is what each means - and this remedy solution. The Thud. The Carbon knock. Other engine noise Mega Power ends. 6-This heavy thud-repeating sound - from the top of your motor - usually in the mornings, like it wants to come apart, is caused by carbon buildup on top of the piston that collects there - A $3000 plus "Valve Job" - is the common method to cleaning the top part of your motor, and Mega Power can also be the common fix choice here. Worn bearings causes a heavy thud-repeating sound - from the bottom of your motor - usually just before or after you take your foot off the gas - and sound like it wants to come apart -it does! This needs a new engine, but I have a formula for that - call for it. Instead, use the Mega Power Engine Treatment with new chemical technology to remove the carbon in minutes - and end the knock for a great running car again. Do it yourself with this under $100 product that works every time. shipped to your door with directions by FedEx in 3 days, phone help, guarantee. 3 items shown are added to the top of the motor, 3 are added a week later during an oil change. Driving does the actual fix. Nothing to take apart. Includes easy-to-follow instructions, phone help, guarantee. Shipped to your door in 3 days. One Mega Power Engine Treatment $84+ $15 s&h= $99 total. Engine tap negatives Mega Power corrects to return noisy motors to quiet and strong running again. To order by phone or ask a question call me at 512 665 3388. "Gets you on down the road running quiet and smoothly again, "avoids an expensive repair," "kept my newer car running trouble free, years past after the warranty ended, too," customers tell us! Order Two Motor Treatments. Clean and protect 2 motors. Just 120 for 2 cars. 12 items. Plus $15s&h= $135 total. Save $25. Order a Mega Power Transmission Treatment #RS3 also. Protect the integrity of your transmission - and for smoother shifting. Includes a cleaner flush, a conditioner, and protector. A problem-solver and preventer. Just: $50+ $15s&h= $65 total. Order both Engine Motor Cleaning and Transmission Treatment for one car. Same guarantee. Both delivered to you for $125 total. Save $15 on shipping. [Engine and Transmission Treatment shipped to you. $125 total]. Double above order for 2 engines, 2 transmissions. $200 total. Free shipping. Save $50 - and get this $12 bonus Free! Our $12 Mega Power Lube and Penetrating spray for Free - Lubes, frees, stops anything squeaking, stuck, frozen. For home, shop, vehicle use. Offer Limited. [2 engine and transmission treatments for 2 cars, + our bonus $12 spray lube shipped to you. $200 total]. A thud coming from the bottom of your motor, is bad news. A heavy, deep in the motor thud sound that may go away as you pick up speed, then return is a grinding away of bearings, and reapears in between the next increase in speed. Rod-bearings connects your crankshalf to your pistons. The remedy? A good new, or good used motor, or a complete engine rebuild. Time for a motor overhaul. Cost? Maybe up $2500 to $4000. The Mega Power Engine Treatment will get you buy for a while - not letting it get worst, if that's important, until finances for a better choice is taken. This calls for use of the Mega Power Worn Motor Treatment. 6 Items. Easy to install. $84 +$15s&h= $99 total. Engine Tapping Noise: May come and go - sound like hanner tapping on the motor - tap tap tap. 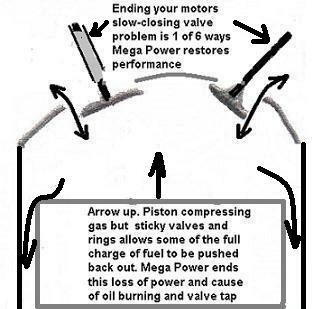 Explained below, valve or lifter tap is commonly fixed by a $1500 to $3000 engine overhaul. It is an oil related sludge problem the Mega Power Engine Valve Treatment, explained below quickly ends the tap for $84 +$15s&h= $99 total. Ping may sounds like glass soda bottles bouncing around your motor. Like "carbon knock," eventually removing your engine top off and cleaning is the usual remedy. Pinging occurs with a load on your motor going up a grade. Ping is cause by bit of carbon stuck to your piston top. Combustion makes it glow like an ember - at engine load it sets off the gas combustion just before the spark occurs - creating two combustion point that smack into each other - making your ping sound. The remedy? Towing, and hot rod type engines ping because they need higher octain fuel. Cleaning with Mega Power and use of MP Octane Boost is a good remedy. Raises octane 5 points. On some motors your worn "timing chain" slack positions spark a little later - so ping occurs. New "chain," About $700. The Mega Power Engine Treatment, ends ping - explained below. Mega Power octane boost is a triple action "non-caustic" ping ending remedy. Dirty internal motor conditions and friction quite harmful as well. As for the thud at the top of your motor. This is caused by a buildup of combustion residue that somehow landed on top of the piston. Overnight, it seems to expand. As you start your motor the piston rises to the top crushing the carbon against the engine head, and you here the thud, which make go away and then return. Repair cost is often over $2000+. You can use the following product to end carbon knock, for under $100 - not $2000. The Mega Power Worn Motor Treatment will quickly remove the carbon and ends the knock. Cost $75 Details below. We favor Mega Power because it is all anti-wear with with chemical cleaners anti-wear, friction reducing - an new special anti-wear, and a protective coating called MC+, that layers over worn piston, bearing, valve, lifter, and gear surfaces, to have them run smoother quieter, and ending the tap and knock problem - a good invention. When sludge from oil breakdown collects and sticks on the valve stem, the sticky goo will cause the valve to close slower. That goo and excessive friction opens up a space on the parts that push the valve up and down. Because the slow-closing valve is not fully closed, the parts that push it up and open smack the bottom of the valve stem every revolution, and the tap tap occurs. If the valve-lifter's self-adjuster is stop up with sludge, a gap occurs, and the tap tap tap sound. It may come and go. A valve repair a mechanic does is often over $2000. You can now use the following product to end those 3 problems in a few minutes, for $75, not $2000. Mega Power removes the carbon on the valve head, cleans the valve stem freeing the valves so they snap-close as they should - again, ending that cause of the tap. Cleaning also includes opening oil passageways to the valve-lifter - the lifter is a valve gap-closing adjuster - to end the tap. When the lifter adjuster is jammed with sludge, or if starved for oil by a blocked passageway - no oil pressure is available to hydraulically help the valve lifter to keep close any gaps, so the lifter will smack the valve - causing the tap sound. Mega Power cleans the oil passage ways and removes sludge in the jammed lifter - ending the gap tap problem for you. "I have had the above problem in a number of my cars and customer cars that came into the shop. The Mega Power Worn Motor Treatment quickly ends the tap cause of the problem, returning smooth powerful quietness to the motor and is the best remedy available ending engine noise. Mega Power's Worn Motor Oil Change Treatment - Pictured above is a product anyone can use to protect, prevent, and correct problems - such as engine tap, carbon knock, and ping. Your money refunded if not delighted. No refunds requested - last 267 days. The Mega Power Worn Motor Treatment. Includes: The 6 items pictured and needed for the treatment. Easy-to-follow Instructions. Guarantee. Price: $65+ $15s&h= $80 total. Shipped Fedex to your door in 3-4 days. Order now by calling - Call 1 512 665 3388. Get on down the road humming quietly again! End your engine tap, now! Learn more about ending your valve problem with this simple tip.